1. Long at 1.3214. Closed at 1.3183 due to new crossover. -31 pips. 2. Invalid short since RSI was already below 50 prior the crossover candle. 3. Long at 1.3200. Closed at 1.3269 when 50-pip trailing stop was hit. +69 pips. 4. Short at 1.3174. Closed at 1.3068 when 50-pip trailing stop was hit. 5. Invalid long crossover since RSI was below 50. 6. Invalid short since RSI was already below 50 prior the crossover candle. 7. Invalid long signal since RSI was below 50. 8. 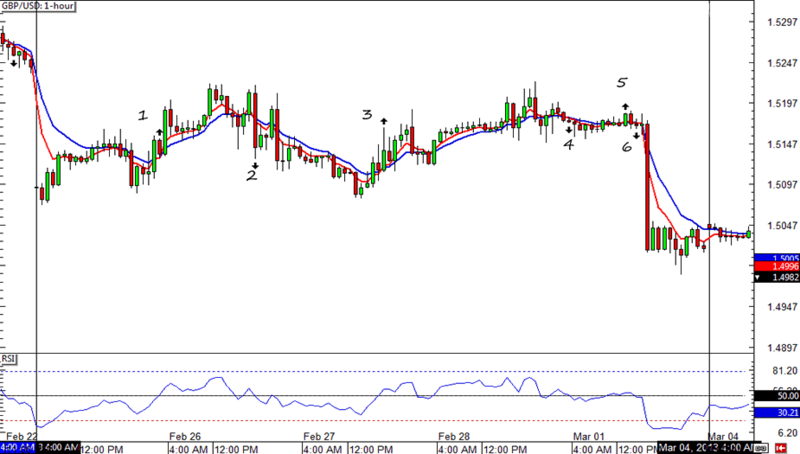 Invalid short signal again since RSI was already below 50 prior the crossover candle. 9. Invalid long signal because RSI was below 50. 10. Short at 1.3119. Closed at 1.3082 due to new crossover. +37 pips. 11. Invalid upward crossover since RSI was below 50. 12. Invalid sell signal since RSI was already below 50 prior the crossover candle. The 50-pip trailing stop did a pretty good job in limiting my system’s losses as well as locking in gains. A quick glance through all the trades that materialized during the week shows that the Trend-Catcher only had one loss on GBP/USD. 1. Long at 1.5134. Closed at 1.5171 when 50-pip trailing stop was hit. +34 pips. 2. Short at 1.5142. Closed at 1.5130 when 50-pip trailing stop was hit. +12 pips. 3. Long at 1.5139. Closed at 1.5140 when 50-pip trailing stop was hit. +1 pip. 4. Invalid short since RSI was above 50. 5. 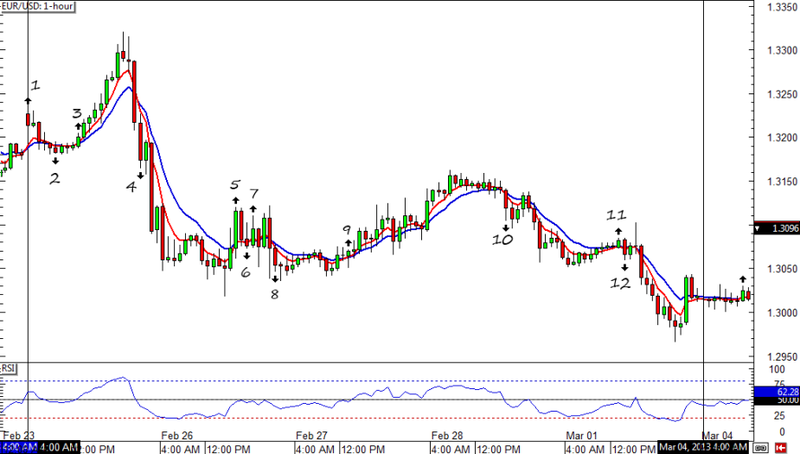 Long at 1.5184. Closed at 1.5169 due to new crossover. -15 pips. 6. Short at 1.5169. Closed at 1.5037 when 50-pip trailing stop was hit. +132 pips. Yipee! I’m definitely happy about my system’s performance. Tune in next week to see if it continues to do well. I really, really hope it does! Hope you all have a good weekend!